This is the land that our ancestors called their backyard, where our forefathers were born, where food was gathered, where families were raised and buried, and where the Moose Cree life and culture thrived. This is the land where Jeff Lemire and Timothy Green II set the latest chapter of their saga for DC Comics in October, 2014. To QUOTE Luke Skywalker: “I am a Jedi, like my father before me”. So here we are, back in the now, with most of our heroes back in Moosonee, chilling and maxing in their freezing cold crib. Well, when I say chilling and maxing, I of course mean giving one another a crash course on why Miiyabin and Heather are there, getting a deep space distress call from their fallen team member, and starting a psychic alien day care center. After the requisite one page summary of the first five issues, of course. For those of you who just picked up your first issue of JLU. And so, with three missions needing attention, our self declared leader splits the team up (after a quick field recruitment) and gets stuff done. Well, most of the team goes off to presumably get stuff done in an upcoming issue. And of course they had help from intergalactic stalkers. But the remaining members certainly get stuff done. Well, one of them did. Let's just get on with it and you'll see what I mean. 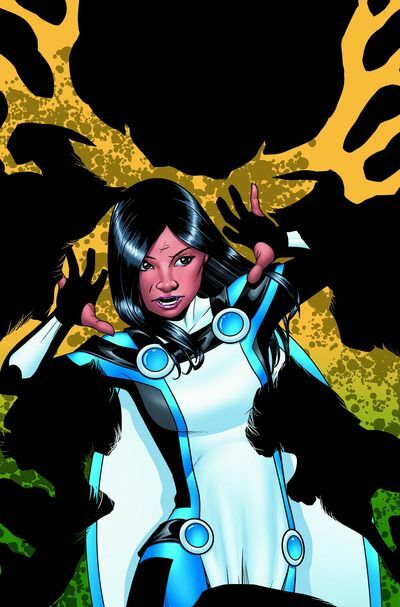 It's been seven months since we were first introduced to Miiyahbin and her powers, but aside from a little background explaining that they're tied to the seasons in last month's Futures End, we haven't gotten any actual explanation about her powers or how they're tied to the seven Grandfathers of the Cree people. Just in case you didn't jump to this conclusion when you saw this issue's title, “The Midayo and the Whitago”, I'll go ahead and spoil it for you -- this issue is all about Miiyahbin's origin tale. Once our team is sent off to deep space, Miiyahbin heads home and gets the low down from her Gohkum. Nope, nothing to do with the Council of Eternity. It's actually a pretty solid origin, with enough left unexplained or implied with images only to fill in later. Spoiler alert: she's a Midayo. Oh my god! It's right there in the title! Oh, what's a Midayo? Well, 身だよ, or “mida yo,” is Japanese for “I only”. But that's probably not relevant. For the real story, pick up this issue. Don't worry if you haven't read the opening arc; it's summarized in one page for you, narrated by your friendly neighborhood Martian. Green draws J'onn in a manner much closer to the “native” Martian look (rather than the slightly softened look most artists take on the Manhunter). Supergirl is looking a bit Martian as well. Sixteen year old Miiyahbin is suddenly thinner, paler, and well, significantly more … chesty than she was before -- a malady that seems to have affected Alanna as well. Sardath has lost his Droopy McCool jowls. (Damn Rannian flash diets). 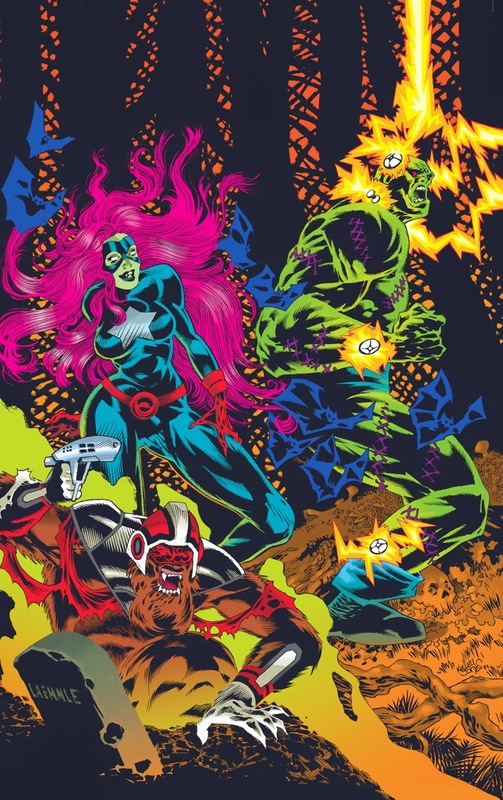 And all the characters feel stretched when looking at Green's elongated style compared to McKone's more muscular, squat, traditional “superhero” style. Again -- I'm not knocking Green -- just calling the sudden shift on so many style elements of our characters as a jarring transition. I think I like his overall look, but it'll take a few issues to get used to the new look on these heroes. Otherwise, a few minor continuity complaints; The battle scene in the summary page was very much not how we saw it play out in the opening issues. Green Arrow is all vague about why he kept the JLA transmitter, despite his reasoning being made very clear in prior issues. A spaceport off in the Polaris system with no apparent Earthlings about has a door bearing both official writing and graffiti on it in English, and only English. Seventeen year old Stargirl doesn't know what a brothel is. And then there's the fact that after being asked to use her x-ray vision to see what's behind said spaceport door, Supergirl goes and opens it before telling anyone else on the team. But that's totally in character. While this issue does spend a little bit of time with our full team, that's mostly to send them off to deep space again so we can focus on Miiyahbin learning of the origin and purpose of her powers. The fact that she's Canadian practically requires us to use a Neil Young song. I don't think I'm spoiling anything by setting Miiyahbin's story to Neil's “Who's Gonna Stand Up (And Save The Earth)?”. For this issue, I'm setting the comparison to the “Hawkeye” episode of M*A*S*H. Don't worry, nobody gets a concussion and spends the whole issue rambling at a Korean family that can't understand a word they're saying. The comparison is more about setting the ensemble cast aside and focusing on just one character. This is really a great issue. It's an interim issue, giving us a quick break to learn about Miiyahbin's powers before taking off in to space again. I'm a bit concerned about this return to space, because frankly, the worst part of this issue was the big reveal at the end as to what's coming in next month's issue. I'm trying not to pre-judge, but we all have our favorite and least-favorite characters, right? But it's got some great moments, including everyone's favorite alien hybrid lifeform uttering his first words in English (which J'onn J'onzz considers his language). Want to take a guess as to what they are?